Classic 243 is an innovative pokies collaboration between Microgaming and Rabcat, combining a traditional slot format and iconic pokies symbols with the exciting 243 Ways to Win feature often favoured by online players. We explain how to play the Classic 243 pokies game for real money at the best online casinos. The basis of this pokies game lies in the title – it’s a combination of the contemporary 243 Ways style game with the classic pokies format. The result is a slick online pokies game that tips its hat to the original liberty bell slots while containing enough exciting features to appeal to modern players. While you won’t find any crazy bonus features or exciting mini games here, Classic 243 is the perfect option for players who want to keep things simple while still offering the potential for some big wins, and will hold especially appeal to the high rollers. Classic 243 is a five reel, three-row game, where every spin brings a potential of 243 ways to win. Paylines are fixed, so you will automatically play for all 243 potential winning combinations. All you need to do is choose the size of your stake using the buttons at the bottom of the reels. All wins are calculated per win way with your chosen wager. You can choose to stake from $0.01 to $0.50 coins per spin, with a minimum total bet of $0.20. The maximum bet is capped at $1,000.00 per spin, making this game suited to everyone from recreational punters to super hi-stake players. Classic 243 is available for both desktop and mobile play with no downloads required. You can try this game at our recommended casinos for free in practice mode to get a hang of how gameplay unfolds first, then sign up for an account to play for real money. Register using our links and you’ll get exclusive access to some fantastic welcome bonuses that include free spins and matched deposits. To play for real money, head to the casino’s banking section and select from a trusted payment method, then enter the amount of AUD you wish to transfer and follow the prompts to complete your transaction. 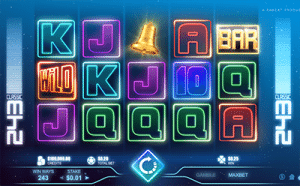 Symbols in Classic 243 consist of sparkly 10-J-Q-K-A symbols mixed in with traditional slot icons like stars, lucky sevens, gold bars, diamonds and liberty bells. We’ve seen these symbols used many times before but Rabcat has done a fantastic job of really bringing them up to scratch with the modern world. The reels are set against a star studded, galactic backdrop, providing an overall futuristic vibe, plus all winning symbols give off a celebratory sparkle when a win is landed. 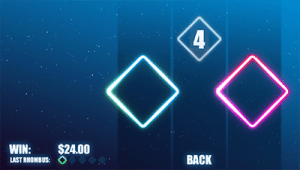 Wild Symbol – The neon wild symbol acts as the games joker, which can replace all other symbols to form a winning combination, except for the scatter symbol. Free Spins – Free spins are triggered by an appearance of three or more of the neon pink free spins scatter symbols. Landing three of these symbols in any position across the reels will award 10 free spins, during which each spin will contain two or three guaranteed stacked wild symbols. If you land another three scatter symbols during free spins, an extra 10 free spins will be awarded. Gamble Game – This is a fun spin on the classic gamble feature, which you have the choice to activate after any winning spin by clicking the ‘gamble’ button at the bottom of the reels. This bonus gives you the chance to multiply your winnings by correctly guessing whether the green or purple diamond symbol is the glowing one. If you win, the winning diamond gives off an energy pulse and you have the option to guess again to further your winnings, but if you lose you will forfeit your win and be returned to the main game. As software providers struggle to come up with a game theme that hasn’t already been done before, we are seeing more and more game developers turn back to the classic slot format to see how they can put a fresh spin on things. Classic 243 from Rabcat is one of the best examples we’ve seen so far, modernising traditional symbols with a new-age feel and adding the 243 ways to win feature to enhance player engagement. The result is a smooth and sophisticated pokies game that is sure to appeal both to players who are looking for something more old-school, as well as a younger generation of players looking for a game that packs an extra punch. Sign up to play Classic 243 at one of our top-rated Microgaming casinos recommended in the table above, where new players can claim welcome bonuses when depositing real money for the first time. Microgaming has launched EmotiCoins, the first ever online pokies game from its Idea Factory initiative. Find out where to play at real money casino sites.